Since the Kangaroo PC was announced in June 2015, I have looked forward to being able to put it through its paces. Quite a few hardware manufacturers have played around with the idea of a small device that can be used as an entertainment device in the home. The Kangaroo press releases seemed to point to using the Kangaroo as an interface into entertainment, with your television being using to view the content. I also wanted to see if it could be used as a type of thin-PC, possibly for those who don’t want to deal with a larger machine or a cheap alternative for schools. According to the Kangaroo website, the Kangaroo is a PC manufactured by a subsidiary of the InFocus Corporation, and the company is based in Irvine, CA, USA. I ordered a Kangaroo from Newegg and wrote a blog post covering the unboxing last week. If you haven’t read that post head on over and take a look: Unboxing of the Kangaroo PC. Today I plugged in a monitor, keyboard and mouse and started using the Kangaroo. The physical setup was straight-forward – the Kangaroo dock, which ships with the PC, has four ports: power, USB 3.0 (x1), USB 2.0 (x1), and HDMI (x1). To turn on the device, I held down the power button for a couple of seconds and the Kanagroo symbol shows. I noticed immediately that the Power LED Indicator was not on – it is supposed to be blue when it is powered on & the battery is fully charged and amber when the battery is charging. However, it wasn’t turning on at all. I created a support ticket with Kangaroo via their webform and as of today (5 days later; including 3 full business day), I haven’t heard back that my ticket was even received. The operating system (OS) setup process is very familiar to anyone who has experience with a Windows 10 device. The OS installed is Windows 10 Home 64-bit edition and was very easy to configure and get started using. I associated my Microsoft account with my login, so at the first login my settings were all set (for the most part), including the desktop background image (wallpaper). I also setup the machine to allow me to login via scanning a fingerprint. 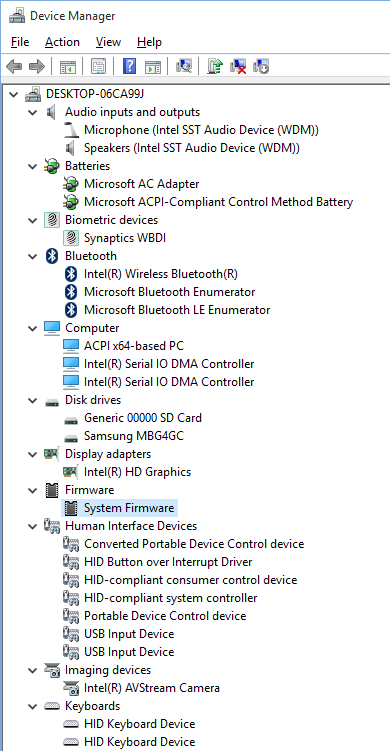 Before I turned on my Kangaroo, I installed a blank 64GB microSD card and Windows started using is without any issue. You will need to install more storage, either by microSD card like I did, or by using a USB device – the built-in drive has less than 20GB of available room available straight out of the box. The Synaptics fingerprint reader performs really well and is just one hardware piece on this device that impresses me. With Intel Bluetooth, a Samsung drive, Trusted Platform Module, and a nice performing CPU, the Kangaroo is actually well equipped for less than $100. The PC is equipped with an entry-level, but decently performing Intel graphics card. 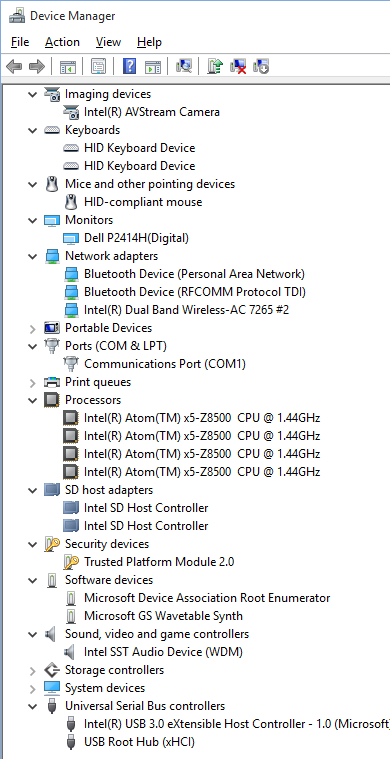 I used a Dell P2313H monitor running at a 1920 x 1080 resolution and the screen looked and performed well. The Action switch on the side of the device can be used to turn on “Wi-Fi Mode”, which turns the Wi-Fi into an access point (AP). This makes it easy to set up software to remote directly into the Kangaroo to manage it. You will probably want to change the default Passcode however (see image below). While I was in the video taking mood, I also did a short video showing that you can indeed unplug the PC from the power source and there be no issues running on battery power. 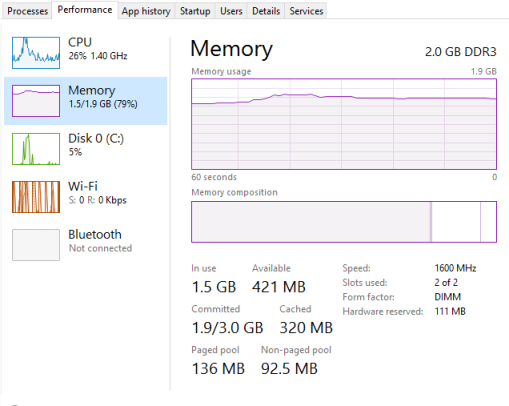 I began taking screenshots for this blog post and that is when I started to notice the biggest issue with the Kangaroo – the 2GB of RAM (memory). I had a MS Paint open, along with six tabs open in Internet Explorer 11, and the PC started having small “hick-ups”. I clicked on a link on a webpage and it would take a second to begin the process of loading. I opened Windows Task Manger to take a look at the Performance tab – the CPU was running at 26% but the Memory was running at almost 90%. That was a spike – it was that way until I started closing IE tabs. I began writing this blog post when suddenly the device turned off. Crashed. Dead. I tried to turn it back on and it would show me a Kangaroo image, but would immediately turn off. I tried turning the device on a couple dozen times, but after the first couple times, the screen didn’t even show the booting image. At some point, the device decided I need to go into repair mode – I never had the option to select doing a repair. However, after only a couple of seconds, the device turned off again. After doing this over and over with different configurations – detaching the USB cables, removing the power cable and booting from battery, trying a different display method – I gave up. Well, not entirely. I removed the dock from the Kangaroo and let it sit overnight. Actually, it was over 24 hours before I came back to see if the status was different. With the HDMI, mouse and keyboard plugged into the USB ports, and the power connected to the dock, I connected the dock and the Kangaroo. Immediately, the Power LED indicator turned amber . Yup, the LED was now working and it was indicating that it was charging the battery. This was a good sign! I turned on the Kangaroo by pressing the power button for a couple of seconds. Windows started up and performed an update before it automatically rebooted. Once the computer rebooted, the Windows login screen appeared and I was able to login via the fingerprint scanner. So, I am not finished evaluating the Kangaroo. If it wasn’t for the crash, I would probably have a very positive outlook on the device. However, I am holding back any big praise after I have seen it perform over a longer period of time.